Milwaukee, WI - It seems like just about everyone has Brewers fever right now and the Admirals are no exception! The Ads will celebrate the upcoming Brewers season when they take on the Chicago Wolves Friday, March 8th at 7 PM and the Grand Rapids Griffins on Saturday March 9th at 7 PM at Panther Arena. 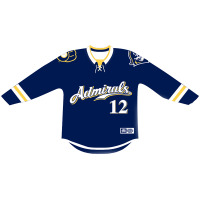 For both games the Admirals will wear Brewers-inspired jerseys that the will be put for auction. Bidding is open now at www.milwaukeeadmirals.com and will run until 8:30 PM on Saturday with proceeds benefitting the American Cancer Society via Lee Jeans Denim Days. In addition, the fans who win the jerseys will have the opportunity to meet the player post-game on Saturday. Saturday is the last chance to participate in the 2-Man Advantage ticket special. The 2-Man Advantage will get fans a ticket to Saturday's game along with a Brewers game ticket (either March 29th or May 3rd) for just $22. The 2-Man Advantage can be purchased at http://brewers.com/admirals. Additionally, the first 2,500 fans through the doors on Saturday will receive a FREE Admirals/Brewers t-shirt.